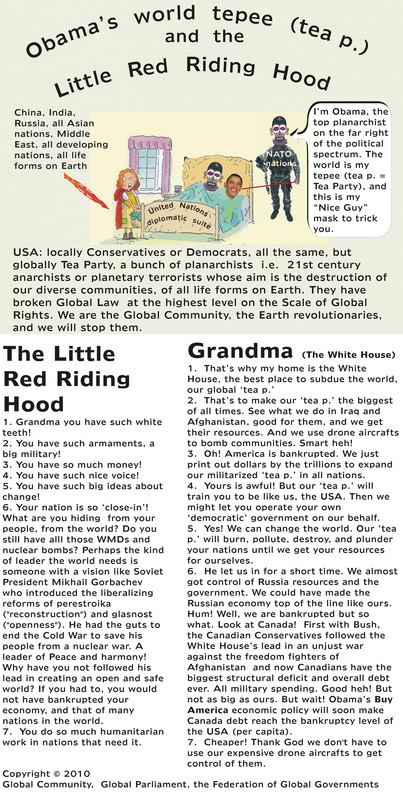 The above image titled "Obama’s world tepee (tea p.) and The Little Red Riding Hood" is part of the addendum to the paper published in January 2010. The paper itself gives a more detailed description of the imagery work. Let us define further the different components of the imagery. Obama is truly a representation of America today and NATO friends wanting to defend an old way of doing things, 20th century thinking, but knowing this will not get them anywhere. The people of those nations have the stomach of a 'black hole' where everything on Earth is absorbed anb consumed without rules but those of the gun and fear. Obama is pointing out his own public face, a truly friendly face, a person able to make believe 'change' is possible that would make everything right in the world. But that was shown to be a lie during the Copenhagen Summit on Climat Change. Humanity itself was part of the lie. Humanity has lost track of what is the most practical thing to do to save life on our planet. Several decades ago, similar self-destructive activities on the part of humanity gave rise to the Global Community, the Earth revolutionaries. NATO wants to be the gun for the corporate wealthy but eventually will absorbe itself and died out in its own 'wasteland'. People of most nations no longer trust America for anything. America is doomed to nothingness and will be absorbed by its own 'black hole', its 'wasteland'. The United Nations (UN) is the global suite with no justice where everyone can go unpunished and get a Nobel Peace Prize. The more destruction you do the bigger the prize. America and its NATO friends got the biggest prize of all. The UN should never be promoting war as a solution to world problems. That alone is against global sustainability. Sustainability means no war. War is the greatest act of destruction. There is no worst action than war. The UN is promoting a culture of violence and war, and certainly that goes against global sustainability and Global Peace. That is the worst thing the UN could ever do to humanity. It is totally opposite to the Vision that the Global Community is promoting. And it is totally insane! The leadership of the UN has failed to enforce disarmement. All weapons of mass destruction should have been phased out a long time ago. Why are the USA still holding the world hostage with its 40,000 nuclear war heads, and biological and chemical weapons of mass destruction? What has the UN ever done to help the phasing out of WMDs? Now several nations, including North Korea and Iran feel threatened just like everyone else and will refuse to be invaded. They would rather take on the US. Russia and China will also refuse to be invaded. The Global Community is very concerned about the state of the world today and the causes that brought up so much frictions and wars between nations. Ever since WWII, the world has seen the rise of an invading world power, the USA. The United Nations has never done anything to stop the invasion. The UN leadership has been one of a 'watcher', an observer. The UN watch the world go by, on the brink of self-destruction and of being invaded, environmentally and militarily, and do nothing. The United Nations, US Administration, World Bank and IMF are corrupted organizations and never to be trusted of anything. The Global Community will never go along with these organizations. The entire planet is in a state of low intensity civil war. The ruling elite profit off the exploitation of the rest of the world. Over several decades now, and in several press releases, the Global Community has made everyone aware of this critical situation, and how dangerous the US military and NATO allies were actually bringing the social fabric of the world to a complete breakdown. The October Press Release made that very clear and has caused a domino effect that started with NATO not wanting to take the blame for the global financial crisis and forced the collapse of the financial bubbles in the stock market, the Wall Street financial crisis. Americans are too proud of their military to throw away the blame of their bankrupted economy, in large part onto their astronomically high military expenditures, which truly bankrupted America long before the financial crisis. The financial crisis reflected fundamentally bad financial principles.